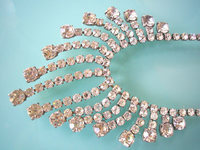 Fabulous vintage Great Gatsby Art Deco style 1950s clear rhinestone fringed waterfall statement choker necklace. This amazing 1920s style necklace comprises a single strand of sparkly clear rhinestones, claw set in silver tone metal. 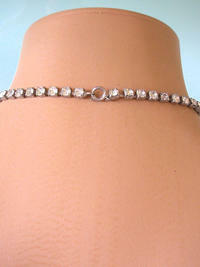 From the single strand hangs a graduating fringe of sparkly clear round claw set rhinestones. 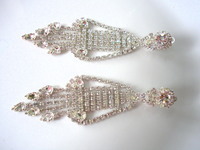 Each fringed finger culminates in a single larger round rhinestone. 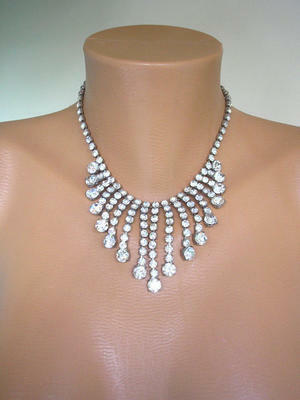 This necklace is in good vintage condition, however, PLEASE NOTE that the silver tone setting does show light signs of wear. Also, a few of the smaller rhinestones are slightly milky commensurate with age, but this does not detract from its overall beauty. 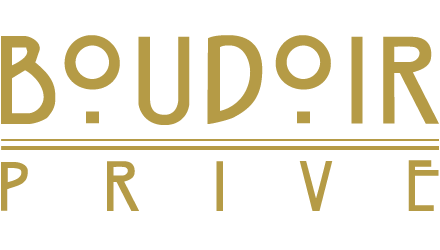 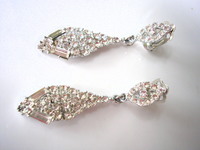 It would make the perfect match for your specially chosen Great Gatsby or Art Deco themed bridal gown. 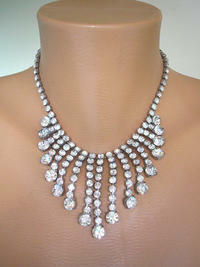 It would also look stunning with a little black dress when worn to a cocktail party or other uptown evening affair. If you are looking for a bit of party glitz and glamour, then this is the piece for you!